Apr. 1, 2017 6:50 a.m.
Don’t worry – the Penticton Peach will always be a peach! The purple paint will be cleaned off this afternoon. Huge thanks to the Peach’s Diana Stirling for making this possible and allowing the Penticton Western News to be a part of the fun. An additional massive thank you to Mayor Andrew Jakubeit, Thom Tischik, Neil Wyper and the ‘protesters’ for being such great sports and jumping on board. 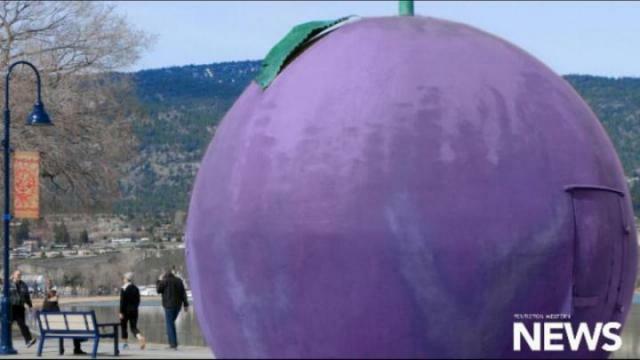 With little notice, the City of Penticton took the area’s iconic Peach on Okanagan Lake and made it a Grape. City crews were on site Friday, taking the day to transform the peach concession into a grape to better represent the current vision of the region. “We are ‘Penticton and wine country’ and to embrace that we feel our iconic fruit should be a grape — not a peach. The wine industry is the largest contributor to Penticton’s tourism,” said mayor Andrew Jakubeit. Believe it or not, it’s an easy task to convert the peach concession, that has in various forms been on the beach since the 60s’, into a grape. City crews began work yesterday, painting a purple base coat on it. Once finished, there will be three shades of purple much like the shading currently on the peach. The leaves on top will be removed but the stem will remain, although it will be narrowed slightly. 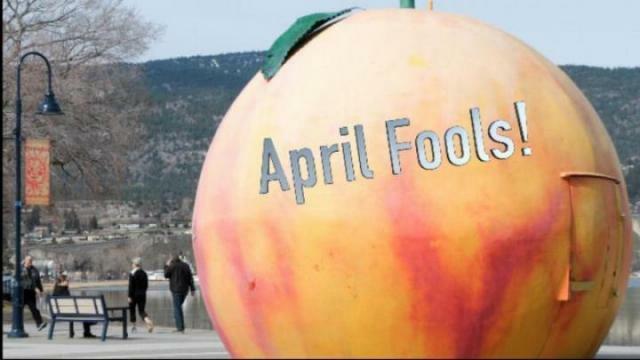 While the City of Penticton is ecstatic about the new colour, the peach’s lease owner is fuming mad at the news – she only found it was happening as the first layer of paint was being applied. “I am frustrated, I’m completely shocked,” says owner Diana Stirling. “I was only just informed the city was painting the peach. Despite the angry reaction, the city’s paint job is supported by Travel Penticton. “I think it is time to change it,” says Travel Penticton’s new executive director, Thom Tischik. “It has been a peach for so many years and now that Penticton is evolving it is time to change and turning it into a grape is the best way to go, I really do think so. The Penticton & Wine Country Chamber of Commerce is on the fence about this drastic move. “While we are thankful that our winery members are being recognized for the economic impact they provide, we shouldn’t discount the significant contribution our fruit farmers have brought – and continue to bring – to our local economy,” says Neil Wyper, chamber president. As for Stirling’s strong reaction to the purple paint, the mayor claims hormones may be to blame. “Females are sometimes very emotional and irrational at times and we took that as fact when we engaged in the community, 80 per cent of those engaged were male to offset that emotional factor that females bring to the table,” said Jakubeit. The peach’s current owner is now calling on all other angry residents to come by the peach this morning, Saturday, April 1 at 10 a.m. to protest the city’s decision. There will be a petition onsite to sign. “We are going to try to #SaveThePeach,” says Stirling. “We are going to send a strong message to city council that this is not OK. Bring signs, let them know you want the peach to stay and we are going to see what we can do. “While it’s too late to stop the painting, we are hoping to send a strong message to city council – this has to stop.